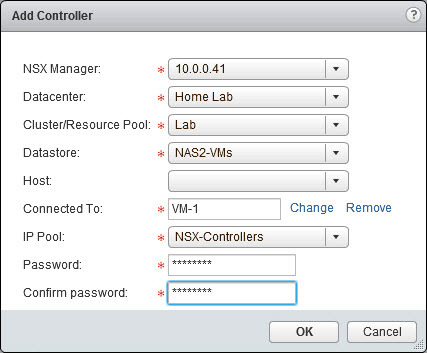 NSX Manager is used to deploy NSX Controllers for managing the control plane activities that take place within the environment. The controllers form a cluster, and like any good cluster will require a quorum (majority) in order to avoid any sort of split brain scenario. A quorum is best achieved with an odd number – such as 3 or 5 nodes – so that it can lose one or more nodes and continue to function as a cluster. The NSX Controllers form a cluster with hardly any effort from your perspective. Each controller is deployed and configured by the NSX Manager – with your input, of course – and then join the cluster. By running a show command, we can see the status of the controller cluster from any of the member nodes. The node above is reporting that it has joined the cluster successfully, is connected to the majority of the cluster (in this case, all nodes make up the majority), and it can be safely restarted without taking down the cluster majority and ruining the quorum. You can also read about the controllers from Scott Lowe’s NVP series here. NSX Manager – the name or IP of the NSX Manager server. Datacenter – the datacenter that will house the NSX Controller. Cluster/Resource Pool – the cluster or resource pool that will house the NSX Controller. Datastore – the datastore that will house the NSX Controller. Host – an optional field for when you wish to deploy the NSX Controller to a specific host in the cluster or resource pool. You can leave it blank if desired. Connect To – the network port group that the NSX Controller will use to communicate. After clicking OK, a new VM will be deployed. You can open the console and watch the deployment progress if you’re feeling adventurous. After the status changes from Deploying to Normal, you’re good to go. You might wonder where the NSX-Controllers IP Pool came from. I cheated and made it already, so let’s discuss how to create one and why it’s different from a standard IP Pool. 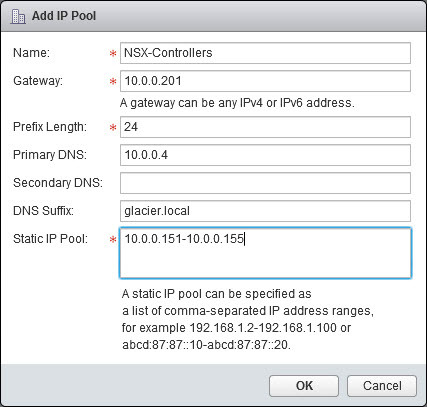 IP Pools are commonly used in an NSX environment for assigning IP addresses to controllers and VXLAN Tunnel Endpoints (VTEPs). There’s no room for manually assigning IPs in the software defined data center (SDDC), and so you’ll want to leverage pools. As NSX deploys more controllers and VTEPs, it will withdraw IPs from the pool and give them to whatever it is that wanted an IP. It also tracks that IP and puts it back in the pool if the entity has been removed. I would advise setting aside a range of addresses for NSX to avoid IP conflicts. Name – what you’re going to call the pool. Gateway – the default gateway for the pool’s subnet. Prefix Length – the subnet mask’s binary length (sometimes referred to as CIDR notation). Primary / Secondary DNS – Domain Name System servers, optional. DNS Suffix – the domain’s suffix, also optional. Static IP Pool – the list of IP addresses being assigned to the pool. Keep in mind that you will not be able to see this pool from within vSphere. It is not a typical vCenter IP Pool. It lives only within NSX. If you need to view or edit the pool later, it can be found within the NSX Manager > Manage > Grouping Objects > IP Pools as shown below. Ah, the fun part begins! Let’s throw some commands at NSX Manager and get it to do our nefarious bidding. I personally use the Advanced REST Client app within Chrome for fiddling around with the API (also known as debugging), but you can use whatever you wish. Now that you have your REST client of choice, it’s time to generate your authorization string. This will be a Base 64 encoding of your credentials to NSX Manager. If you’re feeling especially lazy, and don’t mind that a 3rd party knows your encoding, you can just use the base64encode site. Enter the string <user>:<password> where <user> is your NSX Manager user name and <password> is your password. If you haven’t made any accounts, just use admin:<password> for now. At this point we know that NSX Manager is properly responding to our RESTful API request, and that controller-1 is properly being tracked. The next step is to issue a POST request that creates a brand new controller. While a GET request will query for existing data, a POST request will create something new. In this case, our POST request is going to create 2 new controllers (one at a time). This time, we’ll need to supply a payload along with the POST request. 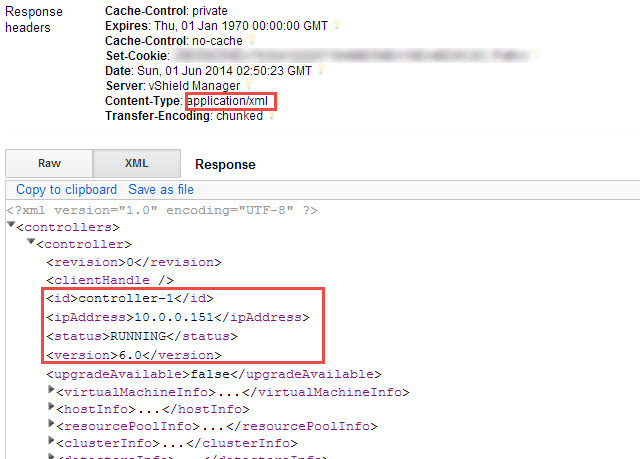 The payload contents are very similar to what was requested in the vSphere Web Client, with some differences. Can you spot them? There are two pretty big differences when making an API call vs the GUI. 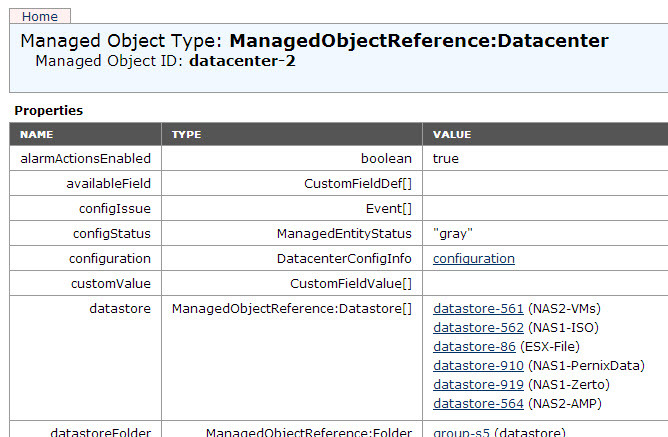 First, all of the XML fields require the ID, not the name, of the component. Such as “resgroup-10” for my Lab Cluster and “datastore-561” for my NAS2-VMs datastore. 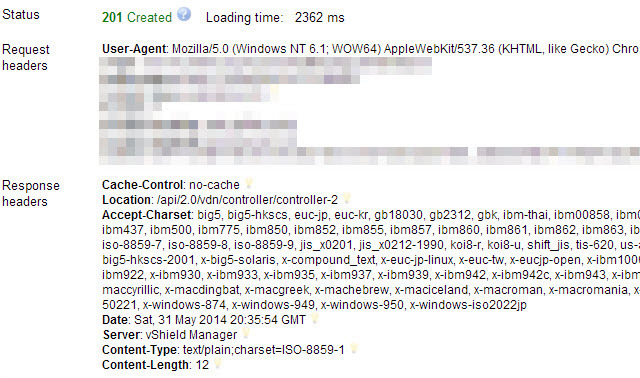 Additionally, you can specify the size of the NSX Controller via the API: small, medium, and large. Once you have the IDs and have plugged them into the API call, click on the Send button. If you get a return Status of 201 “Created” – great! It’s working as expected. Pop on over to the vSphere environment and watch a new controller spin up. After 10 or so minutes, the new controllers should show up with a status of Normal. Repeat the POST request to fire up a 3rd controller. Ignore the fact that my third controller is controller-6. I spent a lot of time building and destroying controllers. That’s it! There is now a 3 node controller cluster for the NSX environment that will be used to handle control plane activities for the virtualized network. The next section focuses on Preparing The Cluster and Hosts. The RESTful API could be useful for NMS integrations. Good. Straight forward example. Thanks for the post Chris. question man, where is the reference (documentation) to vCenter MOB to identify the ID’s to use them in the rest client to use POST on NSX API? I mean to read the source. 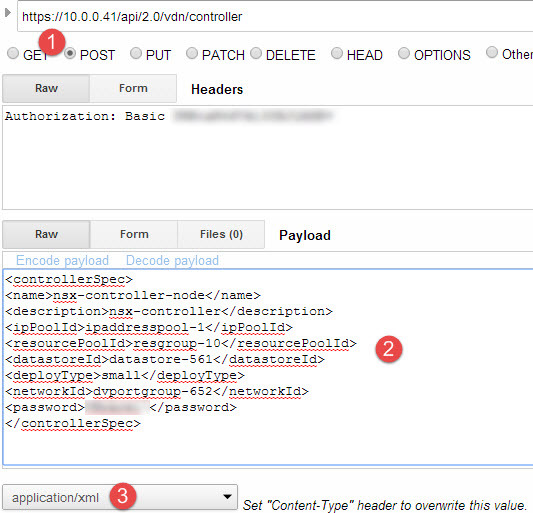 Me again man, awesome stuff, I’m a bit confuse, assuming that exist my ip pool for controllers created previously on the NSX manager, I want to deploy one controller so I look for the ipPoolId and the value is “unset” do I missing something here? Like the tip on the MOB viewer!